We spent New Year’s at home. New Year’s Eve with toddlers sounds like it wouldn’t be very interesting, but you’d be surprised. We explained to the kids that we were going to cheer on the end of the old year, 2011, and the beginning of a new one, 2012. We explained that some people refer to the new year as a “baby.” Within the last few minutes of 2011, we turned on the TV and cheered with New Yorkers during the countdown as the ball dropped. For New Year’s Day, we followed a blend of traditions. From my husband’s Kalenjin culture, we follow the tradition of power-cleaning the house. The belief is that by cleaning on New Year’s, you’re starting the new year off with a clean slate or a fresh start. 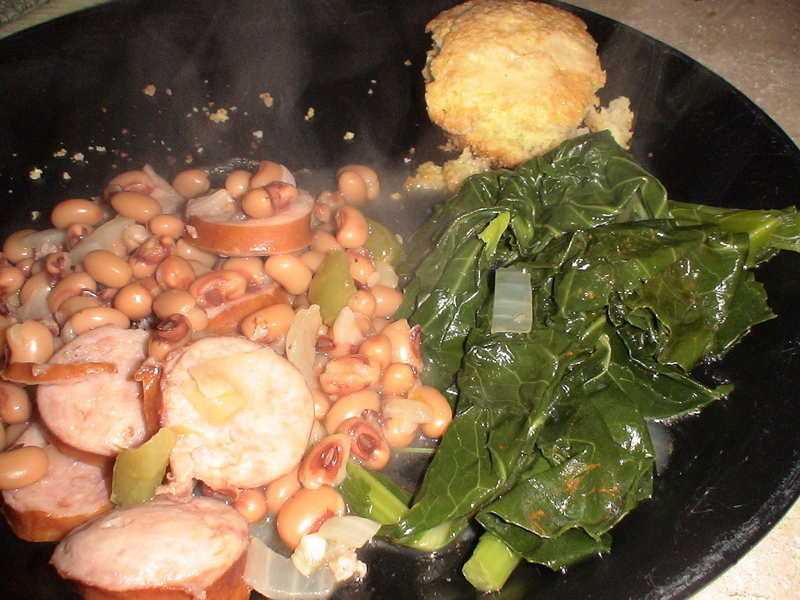 From Southern culture, we cook black-eyed peas and collard greens. I’ll take a moment here to admit that it’s not really something I grew up with, as my Polish-Yankee mother and Latino father. But I grew up in the South, and we’d usually visit someone on New Year’s Day, and they would serve us black-eyed peas and collard greens. Black-eyed peas represent coins and the greens represent dollar bills–eating them together is supposed to bring wealth and prosperity for the new year. A lesser-known fact about this Southern tradition is that it’s actually an ancient one. The practice actually originated in ancient Israel as a Rosh Hashana dish (serving black-eyed peas with a side of something green), and when Jews immigrated to the United States in the 1730s, they shared this tradition with non-Jews, and it became a big hit. This was true especially in the South, where it blended with soul food cuisine–adding collard greens and pork stock–to make it an absolutely fantastic culinary experience. The black-eyed peas recipe I use was passed to me by a friend with Arkansas and New Orleans roots, although the recipe is more Louisianian in flavor. 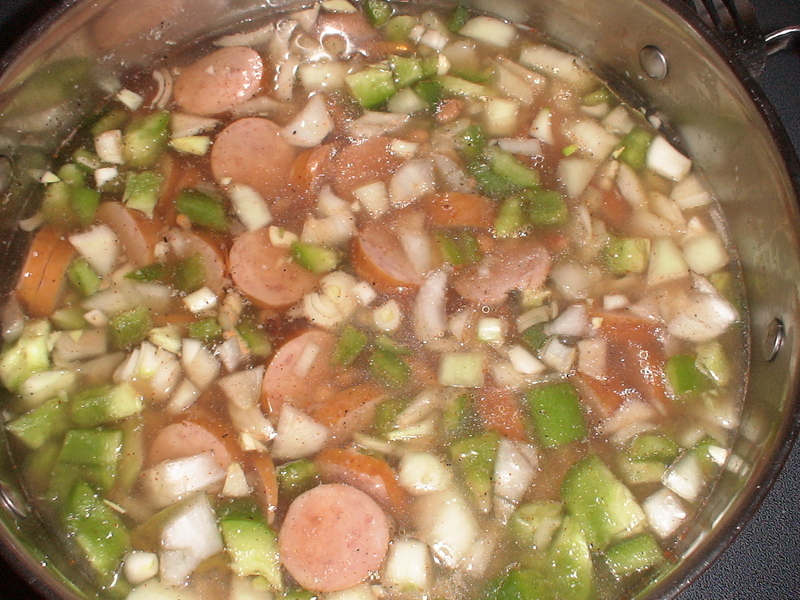 Now that I am living in Ohio, I had the added challenge that such things as fresh black-eyed peas and andouille sausage are next to impossible to find, so I had to make do with canned black-eyed peas and kielbasa. It still came out all right. The following few days, as I’d briefly mentioned in my last post, we’d been trying to watch the skies for the Quadrantid Meteor Shower. However, the only thing we saw falling from the sky was a bunch of snow. Sadly, the clouds blocked out most of the stars. And now, from my having been going out at 3 am in hopes of seeing a meteor so I could wake the kids and show them, I seem to have been bestowed with the gift of a nasty head cold. What a way to ring in the new year! [insert sarcastic face] It has taken me three days to write this post because it hurts my head to look at the computer for extended periods of time. This recipe is very simple to make. 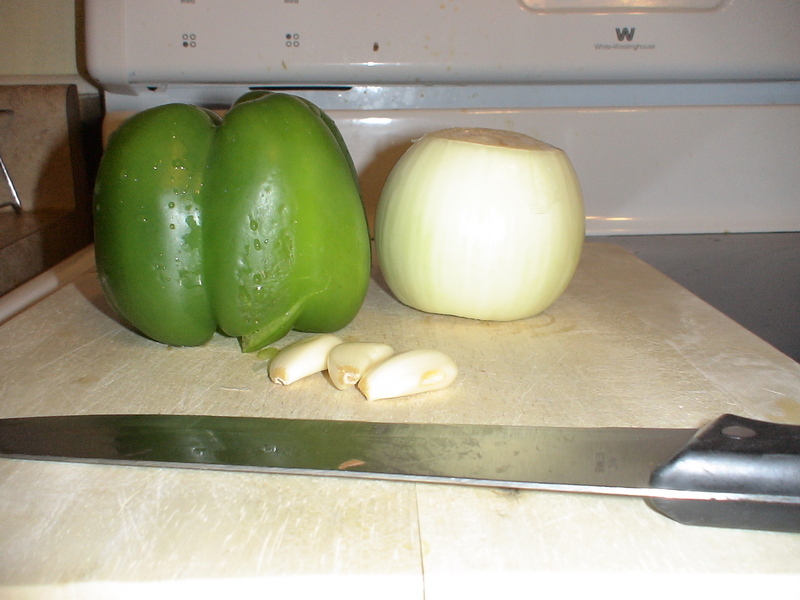 You can prepare it either in a crock pot or on the stove top. You could even substitute the black-eyed peas for red beans to make red beans and rice. In fact, this is the kind of recipe that you could set to cook and then go do other chores (like power-cleaning your house for New Year’s). Combine all ingredients in a large pot with 5-1/2 cups of water. Remove bay leaf before serving with rice and/or cornbread. Combine all ingredients in crock pot with 2-1/2 cups of water. Stir and turn up heat and leave uncovered for last hour if consistency is too soupy. 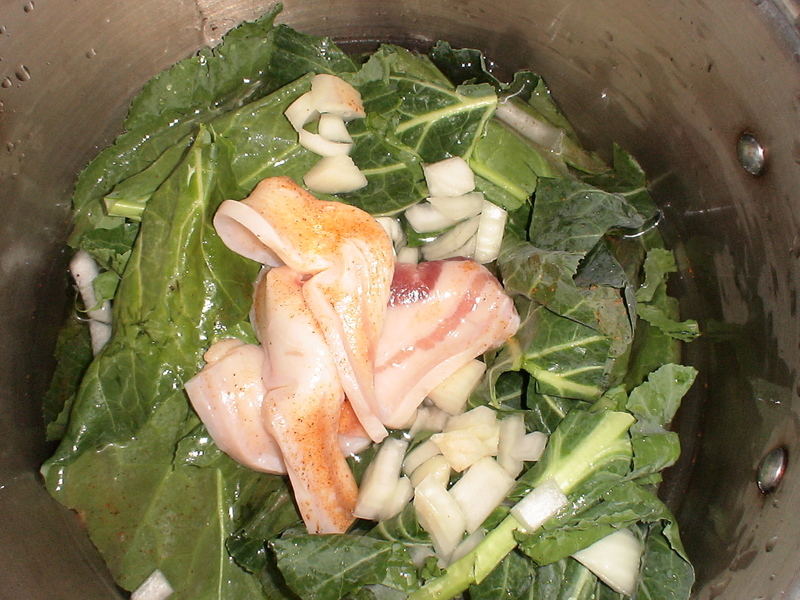 Rinse the collard greens individually and thoroughly. Trim off the stems, if desired. Chop up the greens into strips. Combine all ingredients in a medium-sized pot and fill with enough water to barely cover the greens. Set heat to low and cover. It should take about 40-45 minutes to cook. Once the greens start to soften, stir occasionally. The greens are ready when they are rather soft and don’t taste bitter. Don’t drain out the liquid; it’s jam-packed with nutrients. Traditionally, people soak it up with cornbread or rice.